My hair is very thick, very layered and slightly damaged. I’m not well-versed in anything too detailed or knowledgable about hair-related issues, but I knew that over the long, British winter, my hair took a bit of a knock in the wind and rain (I managed to avoid the snow!). Currently, I’m a huge fan of loose and slightly defined curls in my hair, that I achieve with my Enrapture Totem Styler (review next week when I’ve gathered up photographs! ), but it dries out my hair out to no end, on top of the bitter winter we’ve just had. 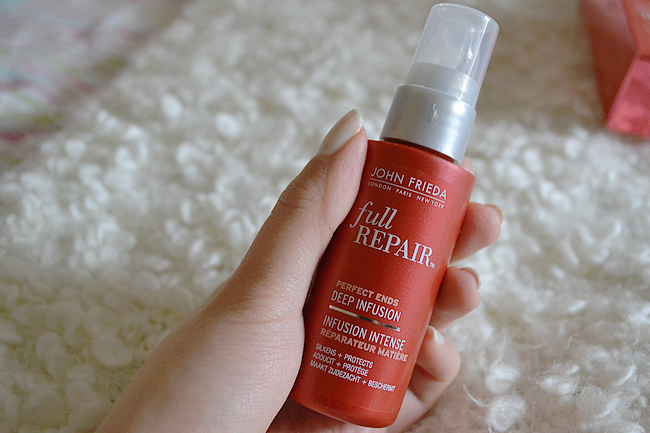 John Frieda’s new Full Repair Perfect Ends range (all over the blogosphere already) promises to deliver products that revive overstyled and damaged hair, which I’m always pretty skeptical about. However! 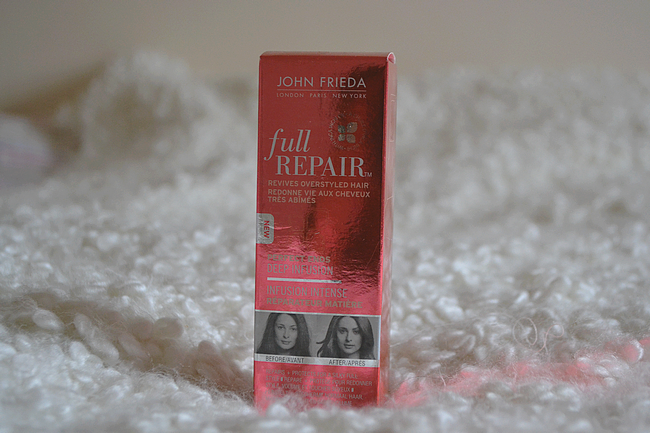 The John Frieda team offered to send me a product to review, and I think I’ve been converted. I’ve been using the Perfect Ends Deep Infusion serum for about two and a half weeks now, and my hair is soaking it all up and reaping the benefits. 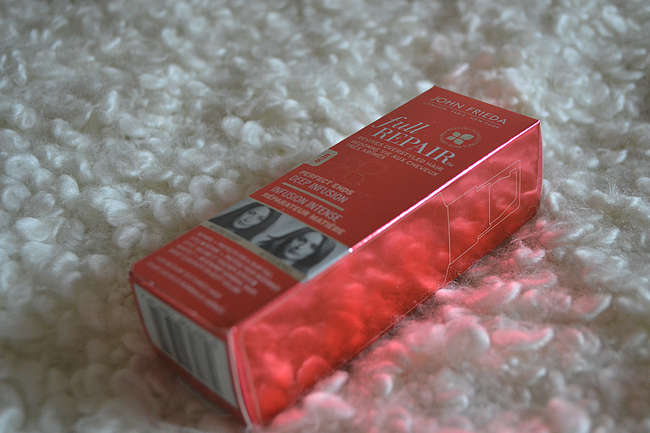 I apply two pumps of this product to my hair, although the box recommends one. One pump concentrating on the ends, and the other to run through my fringe and any hair that frames my face, which gets more damaged as it is exposed when my hair goes up, etc. It smells really nice, a warm perfumed scent without being too artificial, and feels medium-heavy in texture and weight. For reference my hair was subjected to near-daily use of straighteners up until I was about 17. My parents are – or were, at least – super strict and I actually “wasn’t allowed” to straighten my hair or wear make-up until I turned 18, so of course I broke all the rules, and by the time I turned 18, I wasn’t interested in frazzling my hair anymore. I waved a not-so-fond farewell to my straighteners and stopped applying as much heat on my hair (bar the odd, necessary blowdry if I had to leave the house quickly), and my hair recovered. I would really recommend this to anyone who is interested in hair oils, serums and treatments. It is very reasonably priced and I adore the pump packaging (I can’t be the only pipette-deficient person, surely?). It isn’t much of a styling product as Moroccan Oil can be used for, but does leave my hair feeling silky smooth and ‘replenished’, although I wouldn’t classify this as a treatment either. I’m quite interested in trying a more heavy-duty treatment from this range after using this though; the two could be a perfect partnership!